Drs. 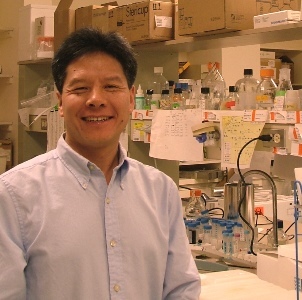 Johné Liu and Yong Tao have been granted a U.S. patent for a novel experimental approach that has the potential to reduce the risk of women producing eggs with the incorrect number of chromosomes. This condition affects about 10-30 percent of fertilized human eggs, and is the leading cause of reduced fertility, miscarriages and birth defects. The patent stems from Dr. Liu’s research on putrescine, a compound which is naturally produced in animals, particularly during egg cell maturation (when egg cells divide to get ready for ovulation and fertilization). His team has shown that when older, less fertile female mice drink water supplemented with putrescine, they have twice as many babies. While this approach is still being tested in animal models, Dr. Liu hopes to advance to human clinical trials in the future.